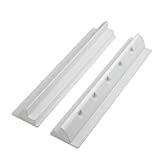 Suitable for use with the Biard white framed solar panels or with a solar panel with a maximum depth of 45mm, this set of two end mounting brackets/spoilers ensure a secure fixing to the roof of your boat, motorhome or caravan. The Biard mounting brackets have been specially designed to support a solar panel at the best possible height so that the air flows sufficiently underneath. When the vehicle is moving the brackets will deflect the air off the solar panel. These high quality mounting brackets/spoilers can be bonded directly to the required surface.